Demi Lovato is an uprising sensation in the field of pop and rock. An eccentric persona, she is everything from an actress to a singer and a model too. Success didn’t come easy for her. Debuting as a child actress in Barney and Friends her career skyrocketed post the success of Disney movie Camp Rock. An inspiration to all women and a youth icon, she had to witness struggle and hardships like no one else. However, she bounced back from all her sufferings and went on to record her first platinum single in the U.S., Skyscraper from her album, Unbroken. Her quotes, which mostly resembles to the lines of her songs, express her will and determination to fight all odds and rise again. Some of her best quotes are very inspiring. They emphasize on being your own motivation and being your true self. The ingenuity about not considering what others think of you reflects strongly in all of her quotes. Her quotes describe the quintessential fight to battle hardships and be completely open. Her quotes suggest that one must follow their own heart and desire and not let others opinions and comments affect them in any way. That is the true mantra to success. 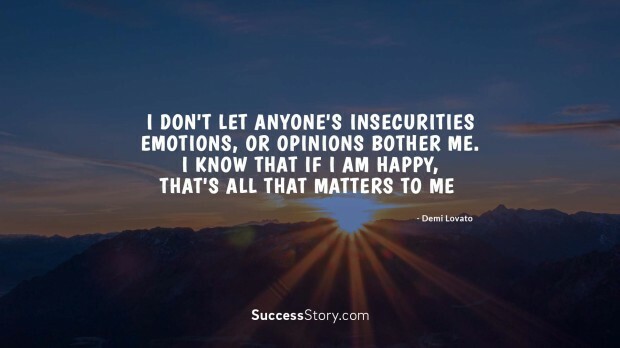 A singer with beautiful words and noble thoughts, Demi Lovato is the epitome of bold and beautiful; an inspiring artist she can be the beacon of hope for people who can emerge victorious against all that they have suffered.